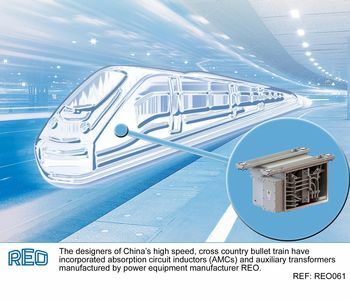 The designers of China’s high speed, cross country bullet train have incorporated absorption circuit inductors (AMCs) and auxiliary transformers manufactured by power equipment manufacturer REO. The components have helped the train improve both safety and passenger comfort. The bullet train, operated by the CRH (China Railway High-Speed), was launched on Boxing Day 2012. Capable of transporting commuters at speeds of up to 218mph, it easily covers the 1,428 miles between the northern capital Beijing and the southern trading hub of Ghuangzhou in a mere eight hours. The service fast became the global standard for speed in the rail industry and is the world’s longest high speed rail line. REO has helped the train improve performance by supplying more efficient drive components. The custom made parts, tested and manufactured in REO’s state of the art Berlin plant, include absorption circuit inductors (AMCs) and auxiliary transformers. Inverters used in modern electric trains can, if not appropriately dampened, lead to electrical instability and, as a result, AMCs should be integrated as part of the main drive. They help counter voltage surges, electrical interference (EMC issues), harmonic distortion, short circuits and, ultimately, complete loss of motor power. The custom made AMCs provided by REO solve these problems by minimising electrical vibration, allowing the train to start-up and slow down smoothly, in the safest manner, with the most efficient motor performance. The transformers act as part of the auxiliary converter, which provides power to internal applications such as lighting, heating and even the onboard bistro car. The job of the transformer is to reliably regulate the voltage supplied by the converter, often in demanding conditions, withstanding shocks, vibrations and electromagnetic variations. To ensure the transformer has a long life, it is completely encapsulated and mounted in a robust casing to minimise damage from external forces. REO’s success in building high quality components is the result of an advanced holistic planning process. From concept to design and manufacture, components are thoroughly tested using rigorous methods, including Finite Element Methodology (FEM); testing concepts in 3D simulation to their maximum tolerances. Passenger safety is one of the key objectives in REO’s intelligent materials selection, resulting in the decision to use light weight, high strength materials on the bullet train project. This ultimately allows the train to carry a greater number of passengers, safely, at higher speeds whilst maintaining economic performance. “In our centre of competence in Berlin, we engineer components to meet the requirements of the global railway industry and, thanks to our partners in the USA, China, India and Germany, we are able to manufacture quickly and efficiently, to the highest standards of quality. These quality standards are reinforced by the IRIS certification in our Berlin plant and ISO standards in the USA and China,” said managing director Steve Hughes of REO (UK) Ltd. The news of REO’s supply contract to China’s CRH comes amid increasing interest in high speed transport systems across the world. With Britain’s own High Speed 2 rail network in the planning stages, and the recent proposal in the USA for the ‘hyperloop’, an induction powered evacuated tube transport system, in concept stages, the timing couldn’t possibly be better.